Dorothy E. Myerscough, 95, of Springfield, passed away on Friday January 24,2014 at her residence. She was born on March 2, 1918 in rural Kincaid, Illinois to Jesse and Lucille Oliver Mudd. She married Joseph Myerscough on October 30,1939 in Maxwell, Kentucky and he survives. 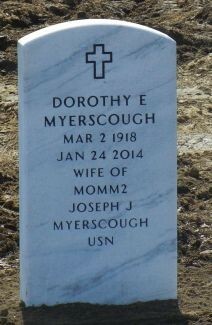 Mrs. Myerscough is also survived by her son Larry (Marilyn) Myerscough of Purcell, Oklahoma, her daughter Judy (Dave) Bryan of Springfield; grandchildren: Lisa (Terry) Whalen, Michelle Elmore, Larry (Priscilla)Myerscough Jr., Holly Myerscough, and Danny Myerscough, step grandchildren: Stephanie (Kent) Walz, Suzie (Doug) Samples, and Stacey Reavley; twelve great-grandchildren, and her brother Paul (Eve) Mudd of Buffalo, Illinois. She was preceded in death by her parents and brother Oliver Mudd. Dorothy loved paints and quarterhorses and enjoyed watching and son show them. She was a talented seamstress who sewed her own clothing while working on the family farm off Andrew Road. Dorothy loved the Christmas Season, hosting Christmas Parties, baking and making candy and spending time with her grandchildren and great grandchildren. A funeral service will be held at 12:30pm on Wednesday January 29, 2014 at Bisch Funeral Home West, 2931 Koke Mill Road, with burial to follow at Camp Butler National Cemetery. The family will meet friends from 11:00am until the time of service Wednesday at the funeral home. Please visit the online "Life Remembered Story" at www.bischfuneralhomewest.com.